Ronald Slye: So do you, do you see the role of your office and of the tribunal as building up the capacity of a country like Rwanda so you can transfer these cases, or is that something that . . . ? Yes, I mean you see, we did have EU funding for capacity building in Rwanda. We had European Union funding, you know, for outreach programs. We also got, you know, Rwanda requested it. And over the last two years I’ve been running courses for prosecution service, you know, investigation, evidence management and handling, international criminal law, procedure and practice, and trial advocacy, you know. You know and it was at Rwandan request but funded by the European Union and we used to go there and run, you know, courses, anything from one week to two weeks. And, and, and we do have, you know, several Rwandans employed here in the Office of the Prosecutor, you know, who most probably after the closure might take their expertise back home. RS: What’s . . .
And one of the, one of the things we’ll be looking at, at this conference is, is, is those countries, you know, in Sub-Saharan Africa that may want to take on these cases because of, you know, if they have jurisdiction, if, you know, we need to identify, you know, capacity limitations. We may not be able to, to, to engage in capacity building but I’m sure we can mobilize resources and there are NGOs out there. There’s International Criminal Services, there’s an NGO that is actually focusing on capacity building. The Open Society Justice Initiative in East Africa in particular with which I’ve worked closely, is – has an active program in capacity building. We’re trying to get the teaching of international criminal law on the core curricula of universities in the region. You know, and there, there are live issues like the Ugandan situation. I think the pretrial chamber is sitting this week or possibly next to consider whether the ICC should defer to, to Uganda to try the Joseph Kony case. They have capacity issues and their Director of Public Prosecutions has engaged our Prosecutor here. So yes, there’s a role we could play in terms of capacity building for those who, you know, acknowledge the need and ask for it. RS: What do you think still needs to happen in order for a case to be successfully referred back to Rwanda? We lost on two things, and one can be corrected legislatively or judi-, judicially. There’s a question of, there’s some ambiguity on sentencing regime. In Rwanda it wasn’t clear. Conflicting pieces of legislation you know and the, and the doubt was resolved in favor of the accused. There was a potential threat that if sentenced in Rwanda he may be held in solitary confinement. We didn’t buy that, but that was what the judges, both the trial chamber and the appeal chamber, thought. The more complex matter that seems incapable of resolution is this whole issue of witness availability. I don’t know whether you’ve read the appeals chamber decision in Munyakazi but basically it comes down to the appeals chamber saying the determinant for a fair trial is at the, you know, whims of an unidentified witness, you know, saying, “Hey, I’m afraid of going to Rwanda.” You know. And that’s what it comes down to. Yeah, yeah, yeah. RS: And is there anything that can be done about that or the . . . ? Well no and I mean, you know, the, you know, the, neither the chamber, you know, the trial chamber nor appeals chamber really conducted sufficient inquiry. Rwanda has facilitated witnesses, defense witnesses to come to the tribunal and safely return to Rwanda. I’m yet to hear of a defense witness who’s been bumped off. It’s our prosecution witnesses who get bumped off. But Rwanda too has facilitated the travel of witnesses to Belgium, to Canada. You know for the trials Belgium has held to date, I think about four trials; the Butare four, the Kibungo two, Ntuyahaga, yeah – four, yeah about seven, seven, eight accused defendants. And Rwanda has facilitated the travel of both prosecution and defense witnesses, who've safely returned home. 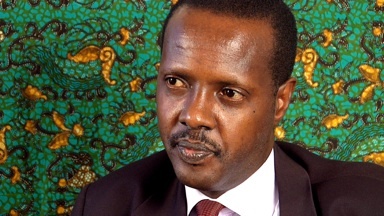 We don’t have any capacity for protecting witnesses in Rwanda. It’s done by, you know, the, the, the Rwandans. We protect witnesses when they’re in Arusha by driving them around in bulletproof cars. But when they go back to Rwanda you know, the actual protection is a duty of the state. You know, and when threats are reported we don’t have the capacity to, you know, to do the policing, we refer the matter to the Rwandan authorities, you know, who take care of security of witnesses. I was just looking for example at the, the, the Canadian statistics where the defense had seven witnesses fly in from Rwanda and took depositions of another seventeen, you know. So the, the, the judge, the single judge in the Munyaneza case in Quebec, you know, didn’t get to meet the seventeen. They didn’t have any video link testimony. No, it was, I don’t know whether you’re familiar with depositions taken on a commission rogatoire. Basically prosecution and defense, you know, with an officer of court go to a country, in this case Rwanda, you know, and take, you know, record the testimony, you know. So the testimony of seventeen witnesses was paper testimony, I mean the judge didn’t meet them. The same thing applies to the current trial against Joseph Mpambara in the Netherlands. The investigating judge went to Rwanda, heard all the evidence by deposition. It’s, it's like a mini-trial; you’ve got the prosecution, defense represented and the investigating judge, you know, asks all the questions and if, you know, if either party wants to intervene they’re free to do so. A-, and he’s carried all this paperwork back home. No witnesses traveling to, to The Hague, you know, for the classical, you know, adversarial hearing as we know it here. Now this is so, you know, the point I’m trying to drive home is that the judge or judges determining the matter don’t actually have to have physical contact with the witness. Same thing happens in France. They’re most probably if, you know, the two cases they’re prosecuting, they’ll probably send, you know, an investigating judge down to, to Rwanda who, you know, will bring back the papers and . . . So if it’s good for other countries, for other legal systems, why not for Rwanda, which is a hybrid between adversarial and inquisitorial? Assuming for a moment that not all defense witnesses would be willing to come to, to Rwanda they can have an investigating judge go, you know, with defense and prosecution to take depositions. We have it here; I mean it’s the exception to the rule. We have video link and so do they in Rwanda; they made provision for video link testimony which is becoming very common now. And they’ve got provisions for taking deposition evidence. So yes, I think, I think the decision was very harsh on Rwanda and it’s ridiculous to the extent that the determinant of a fair trial is, is left to the whims of, in this case, unidentified witnesses. The-, there was no witness list, you know. There was no evidence that the witnesses, the purported defense witnesses would be reluctant to go. Nobody had interviewed them to find out, you know. I mean, at least no evidence was presented to, to the trial chamber. So you know, h-, how do you correct that? There’s, you know, we can’t – there’s no provision for appeal against, you know, appeals chamber’s decision. It’s final. S-, s-, so how, how do you correct that? It’s, it's basically ruled out any transfers to Rwanda. So even if – and this is what is happening right now, I think they’re trying to get a judicial or legislative interpretation of the, of the applicable law with regard to sentencing. Even if that is sorted out and clarified, still you know you, you know, y-, you can’t have a fair trial because some witnesses would be reluctant to go. And yet, you know, there’s no evidence, you know, from the witnesses. You know we’d, we'd applied in the alternative that, you know, this matter be remitted to the tr-, trial chamber for further inquiry, yeah.